This year we will be bringing members more educational content and CE opportunities than ever before, thanks to the newest additions to the AACD team: Director of Professional Education, Shane Walsh, and Video Editor and Camera Operator, William Jenkins. 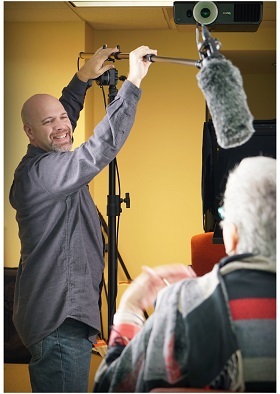 Shane has sixteen years of video production and project management experience, most recently serving as Director of Video Production for eight years at Spear Education. William comes to the AACD with over seven years of educational content experience with the University of South Florida. His background compliments Shane’s skill set and will allow the department to produce content at a significantly faster pace. What did the Virtual Campus need? Up until now, the video content in the Virtual Campus has been a collection of recorded lectures from previous scientific sessions. The old recordings have a value in that they are a great refresher for those that attended the classes, but the idea of sitting and watching a three-hour-long class online is not appealing to many and is also not very effective educationally. Over my eight years at Spear Education, where I built the online learning platform from the ground up, I learned many things and one of the most significant is that viewers will rarely watch more than five minutes of video in one sitting. Just as a book has chapters, so too should education. Adding the ability to go back and quickly access a piece of information from inside a larger course is what makes our content valuable. How are we filling that need? When I started, I immediately began reaching out to members of the Academy to share their knowledge with their fellow members through online courses. I’m filming and editing new courses every day with a goal to release a new course once a month and eventually get to a point where we are releasing courses twice a month. Beyond our highly produced online courses, we are also looking into offering webinars and study clubs among other video based products. "The future is very exciting for the AACD and the Virtual Campus is going to be overflowing with new fresh content." How did you become passionate about this field of work? I fell in love with video and film production at a very early age. I went on my first paying job at 13 years old, were I helped the lighting crew set up for a local car commercial in Chicago. My professional film and video career has spanned more than 25 years, beginning in Chicago where I created educational content for Panasonic, Toshiba and Xerox. Early in my career I lead a team of videographers and editors creating step by step videos to assist installers of network-based office products. From there my family and I moved to warmer weather in Arizona where I began doing more commercial work as a producer for a small agency, and then to Los Angeles where I worked for the Walt Disney Company in Home Entertainment where I created bonus material for DVD release including behind the scenes, menu design and commentary tracks. We moved back to Arizona and I took a job with a small up and coming company called Spear Education. When I started with Spear there were only a handful of employees, and I was asked if I could build out the company’s expansion into online education. Over the next eight years, I built out a complete video production department of five camera operators and editors as well as three different green screen filming studios. In my time there, my team and I created more than 1600 pieces of online education. I’m excited to bring my skills and talents to the members of the AACD and build out an online campus containing a plethora of cosmetic and restorative dentistry topics, all while utilizing everything I learned about online education along the way. The thing that I love most about the work I do is that I learn something from the on-camera talent every time I film a course. I’m also obsessed with technology and in video production and post production new technology is introduced on an almost daily basis. "You are part of a living breathing system of knowledge and expertise, so teach each other, learn from each other, and become a part of the AACD Virtual Campus educational network expansion!" What are the benefits to members interested in being an educator for the Virtual Campus? There are a lot of benefits to recording a course for the AACD. When you record a course, that information lives on for years and informs, educates and impacts thousands of members and the lives of potentially millions of patients. Additionally, when you create a course it forces you to write down the things that may have become second nature in your practice. Once you've written the information down, you will be surprised at how it makes you more effective by visualizing your process and seeing areas to fine tune and improve. I’m a firm believer in the idea that if you share your knowledge, it makes you better at your craft. Lastly, the best way to become a better presenter is to do it more often and receive constructive criticism. Working one-on-one with me in a closed studio setting, I will impart my 25 years of video production experience working with on camera talent to help you improve your performance. "I’m a firm believer in the idea that if you share your knowledge, it makes you better at your craft." What is the process for filming these Virtual Campus courses? Filming a course is a very laid back experience. I make every effort to create a calm and relaxing environment for you to perform at your highest level. We start by selecting a topic you would be interested in teaching, and then I will work with you to create a written script of your topic, which I can then put into the teleprompter. Working off a script is the best way to ensure that you present professionally on camera. A script also allows you to time out your education to create clear short segments that are easily digested by the members. I like to create 45-minute to one-hour long courses composed of five minute or shorter segments. This way, the course meets CERP and PACE requirements for one hour of CE, but also having the course broken into segments makes it easier for viewers to go back for a refresher and get right to the information they are seeking. What are some topics do you need covered for the Virtual Campus? Home care issues in esthetics. What advice do you have for people who are camera shy? Being camera shy prevents a lot of people from recording a course. The single best piece of advice I can give to someone is to practice your presentation. "The more you rehearse and fine tune the wording in your script, the more natural it will become to record in the studio." Recording yourself at home rehearsing takes all the pressure off because there is no one else in the room except you, and if you make a mistake, you can just delete it. Think about your on-camera performance as you would a stage play; before you go to see Hamilton at the theater, those actors have rehearsed the play hundreds of times. They know the material like the back of their hand. Do the same thing for your course recording. Rehearse the course and fine tune it each time. Each time you rehearse, you can find a more effective way to communicate a complex concept. How would you like people to contact you? "I’m really looking forward to working together to create something compelling and amazing that will educate our members and impact the lives of patients for years to come."